Step outside your back yard onto the golf course. Meet your new neighbors at one of the several community events. Surround yourself with the beauty of Hill Country Lifestyle. Relax your mind and soul by fishing on one of our several lakes or jogging on the miles of trails laid out ahead of you. Lantana consists of 32 pristine and unique neigborhoods where you are sure to find a house to call your own. Homes are currently being constructed in several neighborhoods. With beautiful views of lakes and Lantana’s private golf course, we are positive your perfect house is waiting for you. Life in Lantana is more than just being a part of another neighborhood. Lantana’s rolling topography, exceptional landscaping, Hill Country architecture and masterfully carried out development theming has re-created Austin’s famous laid back Hill Country lifestyle. The monumental entrance is characterized by the iconic windmill, low stone walls and tree grids. With over 1,700 total acres of Texas beauty, Lantana is sure to deliver an unmatched experience from anywhere else around. Discover more about what life is like in Lantana. Whether enjoying a family walk or ride on the hike and bike trails, splashing with the kids in one of the five pools, playing a round of golf with friends or visiting with neighbors in the state-of-the art fitness centers, there truly is entertainment for everyone at Lantana. Need a night alone? Lantana’s on-site daycare offers extended hours to accommodate the busy schedules of Lantana parents as well as Parent’s Night Out twice monthly as well as summer camps. 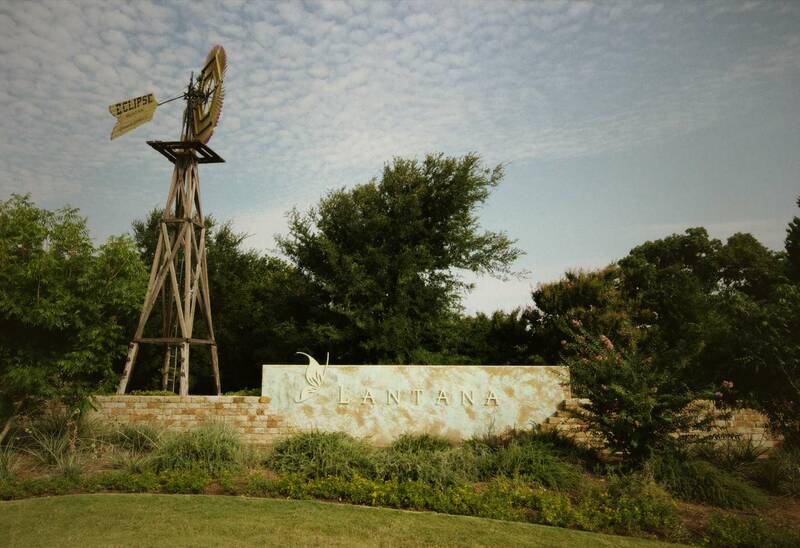 Come discover why Lantana has been named Dallas/Ft. Worth’s “Community of the Year” four times by Dallas Builders Association. Lantana has taken great care to select the most innovative and respected builders in the Dallas/Fort Worth area to create the ultimate haven for lucky homebuyers. Our knowledgeable employees at our state-of-the-art Information Center / New Homes Sales Center can give you more details on any current or future availabilities.